Rail Enterprise Group is a corporate entity that owns and operates two short line, class three railroads and an affiliated company offering industrial site selection services. Rail Enterprise Group establishes policies and procedures that are implemented at all corporate entities. These focus on: security, safety, customer service, process and productivity improvements, and cost savings. Once developed and vetted, they are implemented throughout our portfolio. Industry best practices are studied and evaluated by our subject matter experts and improved upon to meet the needs of our customers. Rail Enterprise Group was formed in 2001 with the creation of Raritan Central Railway serving the Raritan Center Business Park in Edison, New Jersey. Later, the Pennsylvania & Southern Railway serving the Letterkenny Army Depot and the Cumberland Valley Business Park in Pennsylvania, was added to our portfolio. Our experiences at these two properties have allowed us to become a leader in revitalizing operations within business parks created at active and inactive military bases. 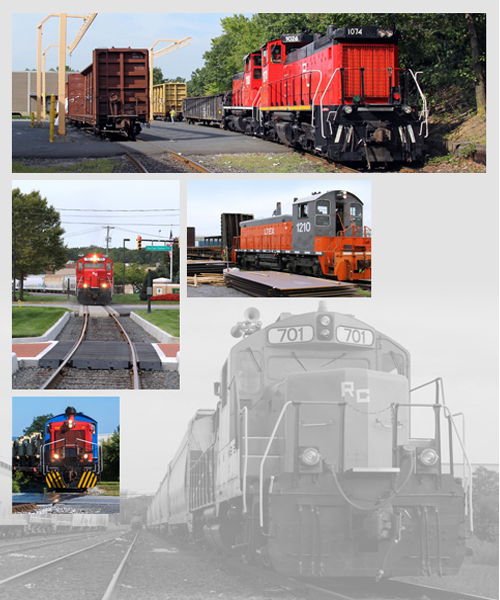 For nearly two decades our railroads have continually expanded their infrastructure, operations and service offerings. This has allowed us to position ourselves as one of the leading providers of rail-served transloading, storage, packaging, warehousing, and logistics services in the Northeast region. We have a proven track record of creating value for site owners by co-marketing the site and bringing customers to the industrial parks that we are located at. We are proud of our safety record and of our “Customer First”, customer service program. Rail Enterprise Group has formed alliances and marketing relationships with many industry-leading railroad, logistics, and trucking firms throughout the country. This has enabled us to offer our customers low-cost, reliable service to any point within the continental United States as well as international. Our operations of the rail system at Letterkenny Army Depot has given us the additional qualification as an approved operator at a Department of Defense facility with experience transporting munitions and heavy equipment. We are extremely proud of our corporate philanthropic activities. We have started a “Gold Star Mom” program for US Navy Seal Gold Star moms as well as creating several memorials for United States Navy and Department of Defense special operations killed in action.